Nichole Elizabeth DeMere’, a SaaS Consultant and Customer Success Evangelist tweeted yesterday about two major mistakes she frequently sees SaaS companies making. Her article explains a fundamental issue of not understanding and talking to the right target customers for their business. Without an understanding of what your customers are trying to do, and the context in which they are trying to do it, you won’t end up offering the right products to help them succeed. If your products don’t help your prospective customers, why would they buy your products? Nichole’s advice is spot on for assuring that you build your offering such that you’ll help your customers solve their problems. Nichole’s article reminded me of some work I did for a client last spring. This client has a SaaS product (If you need a primer on SaaS, here’s how the economics of the SaaS model work, generally), and our workshop focused on closing this gap between the company’s vision / strategic goals, and the backlog of items the team needs to work on. We had executive, product manager, product owner, and engineering team participation. Even if you aren’t currently worried about the economics of SaaS, if you’re a product manager or if you are a product owner, you should be thinking about the strategies that drive what your product becomes. In a workshop last spring, I had the pleasure of working with a team to frame the longer term goals of their business – in order to prioritize the areas of investment that would drive their thematic roadmap. The company has particular goals for revenue growth. By visualizing the contributions to revenue of each customer cohort, we can see customer churn very clearly. Some percentage of your customers will leave every year. This is churn. The growth in 2017 is “all the customers you gained in 2017, minus all the customers from 2016 who left, and minus all the customers from 2015 who left.” The pattern continues – it is a vicious cycle. Eventually, so many customers are leaving that you cannot replace them all. This excellent article on SaaS metrics by David Skok goes into depth on the asymptotic “maximum revenue” dynamic – the rate at which you lose customers creates a ceiling for how large your company can ever be. In some corner of my brain, Nichole’s quote combined with the news report from last fall that Netflix can predict when, in the course of watching a television series, someone is 70% likely to complete the series. Prediction is useful, when you plan for what you anticipate. Which is what reminded me of the work we did last spring, which lead to this article. By show of hands, how many of you have had a roadmap theme of “improve retention” or “stop customer churn?” Keep your hands up if this theme only made it on your roadmap because your team was already experiencing the problem of losing customers, and was now trying to fix that problem. What if you could intentionally plan on retaining customers, before you start losing them. Strategically planning for, and preventing what you don’t want to happen? With shared understanding of the importance of preventing churn, the team can work with executives to allocate sufficient resources to preventing the problem, balancing the value of reduced churn with other features designed to increase adoption. The company had goals to “grow” – and one of the engines of growth is acquisition of new customers. Another engine – and the one that has made SaaS particularly appealing to me as a business model – is the ability to reduce churn as a way to grow (faster than you would if you didn’t address it). 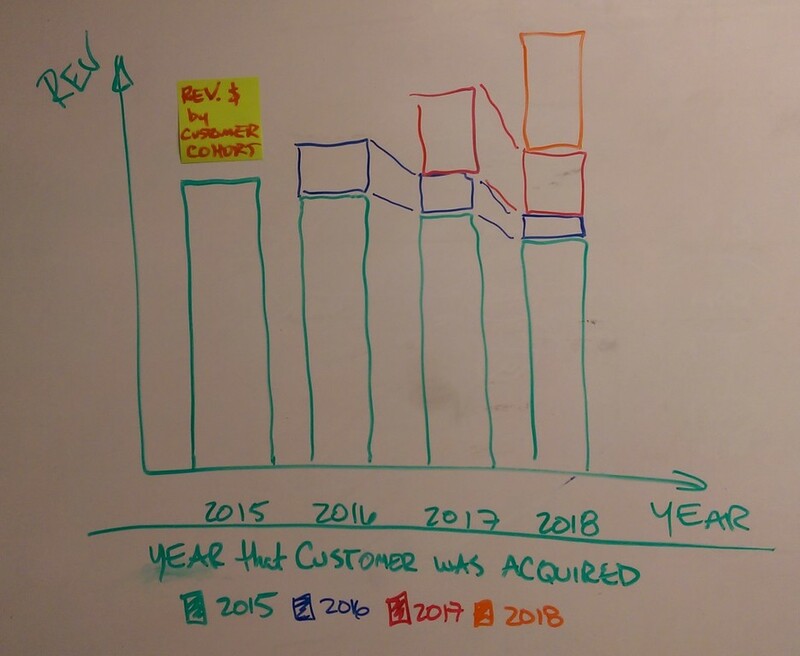 By viewing this growth dynamic (for a SaaS product, in this case) through the financial health lens of the product strategy grid, we were able to emphasize the importance of investing to retain customers, before we started losing them. As a result, the team was able to develop a thematic roadmap designed to support the companies objectives – including preventing the problem of customer churn, instead of having to scramble to fix it by not addressing it initially. Nichole’s article about how to reduce churn reminded me that teams who think strategically can apply her approach to prevent the loss of good customers, instead of scrambling after they are already gone. Thanks to Melissa @ Mode Analytics for sending it my way. A good read (and always smart to quote Andrew Chen!). What looks to be another great add to this conversation comes from Eckhard at Lean-Case. Check out Lean-Case as a tool for potentially working your analytics (or validating a SaaS business case). Unfortunately I don’t have the time to dig into it and really explore, but it looks solid on first blush, so check these guys out.